This past week has been a crazy whirlwind. First, the bar on Tuesday and Wednesday. Then, a huge amount of pushed-off errands on Thursday (including a bday gift for my hubby, part of which mysteriously disappeared from my bag. So if you live in Elizabeth, NJ and see a stuffed penguin, please call me.). Then, flying to Michigan on Friday. Where I am now, soaking up the sun from inside a Starbucks. My kind of summer livin'. This next layout somewhat contradicts my post from last week, but that's life--inconsistent sometimes, right? This one is an ode to my "inner Martha," evidenced by a handmade tag adorning a big basket of homemade cookies. I've only done this once in my life, mind you. But nevermind that. And in other news, my hubby's garden on our terrace has been yielding fruit......a lot of it. Really nothing like eating tomatoes fresh and toasty from the sun. Especially when you don't have to travel to a special tomato-picking farm to experience it. So that's it--my four day summer in a nutshell. Because it's not really summer when you're holed up indoors studying New York civil procedure. Yech. What have YOU been up to this week? Do any of you have gardens, too? Such a cute card - and a pretty layout :) I just had a cucumber for lunch that was grown in my MIL garden. Amazing how much better it tastes than ones avaliable in the grocery store! We all have inner Marthas, I just try to never let her out, coz my inner Martha doesn't cook, bake, you name it... LOL. Cute card and yeah, I make lots of cards and I nver give them out so what the heck? LOL. Glad your Bar exam is over! Love that card! 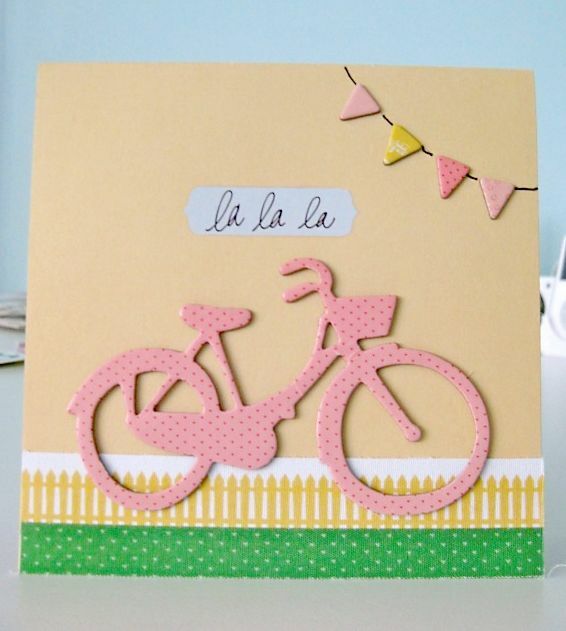 I need to use that bicycle chipboard. We have tomato plants in a pot, but they're not doing much right now. I don't think we're going to get any tomatoes this year! My inner Martha hates to garden - so I am totally impressed with your tomatoes! Love your cute projects and how you used all that AC chipboard. Now I feel the urge to use mine. You & your hubby are adorable! Adorable card and LO! We have grown tomatoes in the past with great success but this year we opted not to since we are traveling a lot. So glad that you are getting some time to enjoy a little summer:) Have a great week. 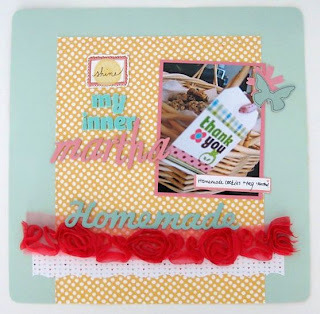 lovely layout & card, miss keshet! :) i don't like tomatoes much, but those look like beauts! Love the thought of an inner Martha! We have a garden. The kid love it but the tomatoes get eaten half ripe ;) Too exciting to let them be! beautiful! i love your pages! thanks so much for your sweet comment on my blog! 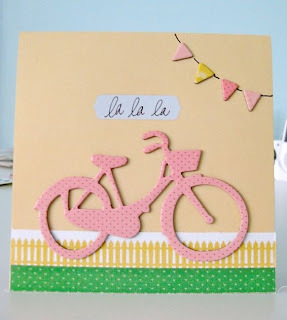 Love your adorable card and page! The colors are just super cute and inviting!! 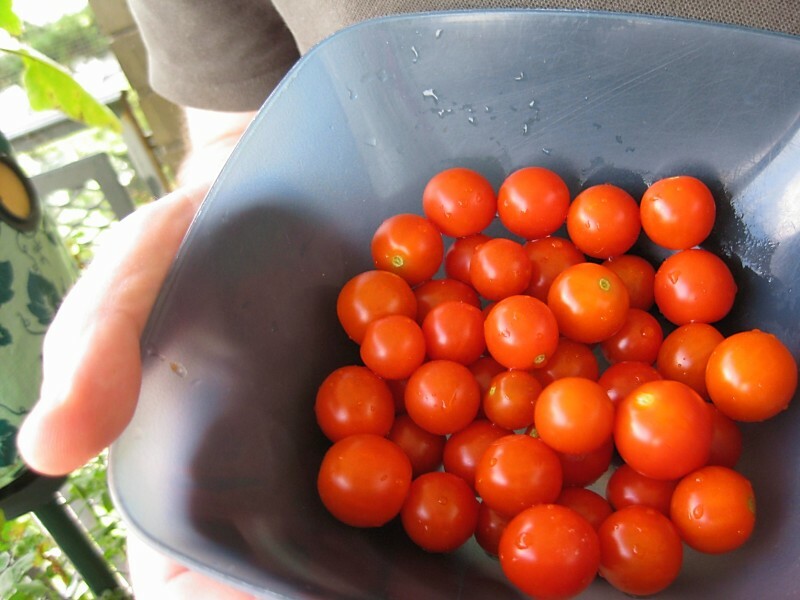 Thanks for sharing your summer... that garden tomatos have me drooling! About my garden..., as long as I can manage not to have weed growing in my yard, then I'm happy! You and your hubby are such a cute couple! Good luck to you re: the bar! As for those tomatoes, they look scrumptious. I'm thinking...bruschetta! Yum yum. P.S. I LOOOOOOVE your blog header! 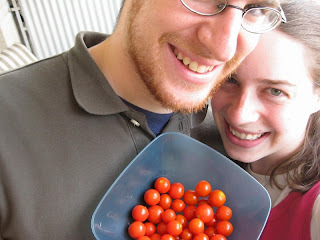 Awww what a sweet picture of you two with your tomoatoe harvest. I didn't plant anything but flowers this year. I always plant tomatoes, but missed out. This summer has been so busy for me.